A classic combination with just a little twist – the apples in the stuffing add a bit more overall crunch to the dish making this a definite keeper recipe. Make sure you use pork chops that are on the thicker side so they don’t dry out. Preheat oven to 375 degrees and spray a 13×9 baking dish with Pam. 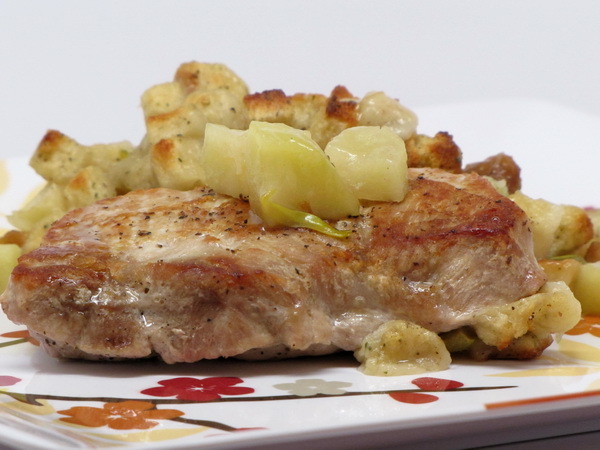 Sprinkle pork chops with salt and pepper and cook in oil in a heated skillet. Brown pork about 3 minutes per side and remove from pan. Add onion and celery to skillet and cook 3 minutes. Add apples and cook another minute. Add broth, soup and wine and stir well then bring to a simmer and remove from heat and stir in stuffing cubes. Pour stuffing into baking dish and then place pork chops on top. Cover tightly with foil and bake 40 minutes or until pork is done.